Join us at the National Home Show! 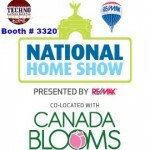 We are very excited to participate this year once again at the National Home Show in Toronto. This show will be running from March 11-20, 2016 at the Enercare Centre at Exhibition Place. Please visit our booth #3320; we will be delighted to meet you. Due to our participation at the National Home Show, please note that our Vaughan location will be closed from March 8th-19th (inclusive); sorry for the inconvenience. However, our Oakville showroom will be open regular business hours during this time. We look forward to seeing you at the Home Show!